Tamera Lawrence has always loved circles. “Circles resonate with me; they’re never-ending,” said Lawrence, a Santa Monica, Calif.-based graphic designer and the self-described “ringmaster” of Mobile Whimsy™ Greeting Cards. Each card in the contemporary Mobile Whimsy line features a mini mobile comprised of three circles vertically placed and decorated with witty wordplay depicted on one side with graphics and printed on the other side with words. In Mobile Whimsy-speak, a message of affection reads “Eye Heart Ewe” and is visually depicted with corresponding graphics. 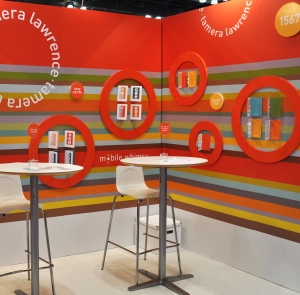 Introduced in January 2012, Lawrence’s hand-assembled greeting card line officially was launched at the 2012 National Stationery Show held May 20-23, 2012, at the Javits Center in New York, where Mobile Whimsy was named a finalist in the show’s “Best New Product” competition. Remaining true to her mobile-infused brand, Lawrence self-designed her 8-foot by 10-foot trade show booth with white cut-out circular frame displays of Mobile Whimsy cards and easy-to-install colorful striped walls – all created with lightweight-yet-durable ½-inch thick Gatorfoam® graphic display board in the Bright White color and 48-by-96-inch sheet size. Still new to the market, the Mobile Whimsy line featured only 30 card selections when it was displayed at the 2012 National Stationery Show. 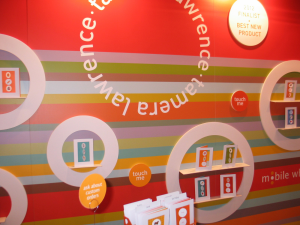 “In order to look like a substantial collection, I needed an innovative display; so, I chose circles and bold-colored stripes to make us stand out,” said Lawrence, who also needed the booth to be lightweight so that she and a friend could handle show setup. 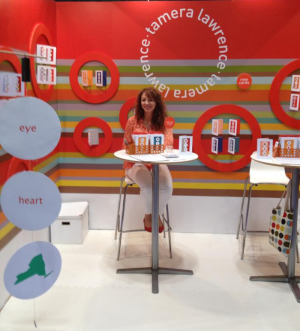 As a small tweak and update for the 2013 National Stationery Show, Lawrence painted the circular Gatorfoam display frame rings on one side with Montana GOLD Acrylic Professional Spray Paint in the red orange color. “The Gatorfoam took the paint well and provided an updated look for the booth,” according to Lawrence, who said she may alternate the red orange and white sides of the Gatorfoam frame rings for another booth look. To purchase Mobile Whimsy Greeting Cards, visit www.tameralawrence.com.